To apply for a job, most departments and agencies require that you complete and send to them their application form. Some may also require a letter of interest or resume. Once they receive your application they will then notify you when they are giving their written entrance test. Most federal agencies require that you submit either an 612 (Optional Application for Federal Employment), or an SF 171 (Application for Federal Employment). The SF-171 became obsolete on December 31, 1994. You can still use the form to apply but it is no longer available in an electronic format. Some agencies will accept a resume in lieu of these forms. Some agencies will accept your application at any time. When they offer their written entrance test, they will contact you and advise you of the date, time and location they will be giving their test. Other agencies will only accept your application to a specific job announcement. If they are not giving their entrance test until next year, then they will not accept your application until they offer the test. Consequently, they will not notify you when they are giving the test. You will have visit their website on a regular basis to see what their hiring status is and to be sure not to miss out on signing up for their test. A lot of agencies give their test through the Office of Personnel Management (OPM). OPM's is a federal agency that supports the federal government's ability to have the best workforce possible. They establish government wide policy and procedures for human resource management, act as a regulator and evaluator of agency behavior, and provide government wide services. One of those services is giving written entrance tests for some federal agencies. OPM acts as an impartial party and helps to eliminate any nepotism. When an agency is hiring OPM will give their test and then send to the hiring agency the top scores. In theory, if a person scored low on the test he would not be able to call his friends at that agency to help him out. OPM will not send his name and score to that agency until higher scoring applicants are hired first. OPM operates the website USAJOBS which lists over 20,000 federal jobs. You can search their website for law enforcement jobs that are offered through OPM as well as the individual agencies. 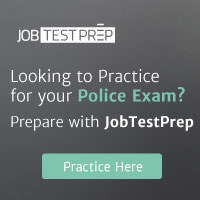 There are some tests you can take which will allow you to apply with several agencies. One of these tests is the Treasury Enforcement Agent Exam (TEA). The TEA exam was good for all of the agencies within the Department of the Treasury: Secret Service, Customs, the Bureau of Alcohol, Tobacco and Firearms (ATF) and Internal Revenue Service (IRS). In 2003, the federal government did some reorganizing sending the Secret Service to the Department of Homeland Security and the ATF to the Department of Justice. Although they are no longer with the Treasury Department, both agencies still use the TEA exam as their entrance test. Some agencies such as the Drug Enforcement Administration (DEA) do not have a written entrance test. You send them your application and if they are hiring and you are qualified they will schedule you for an interview. Most State Police and Highway Patrol offices accept applications on an on-going basis. You can usually apply online or at least find their application forms online by visiting their website. Some agencies require you to send them a letter of interest, a resume, and a completed application. Some states have a state application that you must complete. Once you apply they will notify of their testing dates and locations. These are often listed on their website. Most states also have an employment office that will have information on state law enforcement jobs. This is similar to the Office of Personnel Management on the federal level. Larger cities may have a state employment office that you can visit. Most states will have a website that will list all of the state jobs and application procedures. Most sheriff's offices and city police departments will accept applications on an on-going basis although some may only accept them when a job has been announced. You can visit these offices in person and pick up and application. For most jobs, you can also find an application form online by visiting their website. Most cities and counties have a separate human resource office that will have a listing of current openings and the application forms. In some locations, these offices may be combined providing information on both county and city jobs. The Human Resource Office usually has a website that lists available jobs. You can usually find their website by going to the city or county website and look for a link to "Human Resources." Some departments may utilize an outside company to collect the applications and administer the test. This information will be listed in the job announcement posted on the city or county website.